BlackRadioIsBack.com Music: Drake "aLive" Mixtape 2009 | BlackRadioIsBack.com - Official Blog of the Syndicated FuseBox Radio Broadcast! Hey there to our BlackRadioIsBack.com and FuseBox Radio Broadcast crew! Now, everyone and their Mama has been getting on my case about this Canadian MC Drake, especially with his recent co-signage by mainstream MC of the moment Lil' Wayne & his Young Money imprint and the 9,999,999 spins of "Best I Ever Had" (which makes me want to stab a rusty spork in my ear due to the overload). Quite frankly, I haven't gotten sold on the brother being nice on the mic (blame it on the PR & payola, sorry) until hearing from a good amount of my peoples that he can maintain a dope live show - which I still need to check for myself - as well as giving some in depth listens to some of his recent mixtapes, including the dope one we have below from our fam at TreyPeezy.com that shows he can actually maintain a pretty decent live show that doesn't shame Black Music and is sans autotune, 1,000 weed carriers on the stage, etc. 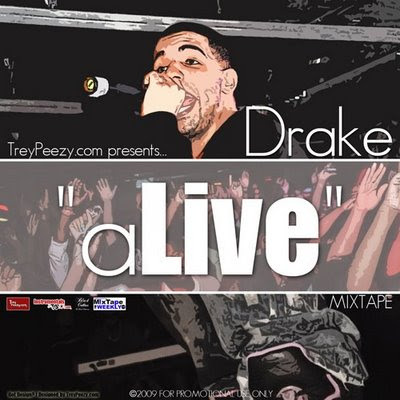 Anyway, check the TreyPeezy.com Presents - Drake "aLive" Mixtape 2009 and decide for yourselves where Drake should stand in the Hip-Hop realm...let folks know what you think! Drake Perfoming In Detroit W/ Big Sean and Wale from Flying With Da Fishes Blog on Vimeo. Hell yeah. I love the post. It's so real!